In an earlier post I mentioned that although we had a good family holiday in the Lake District there were a couple of things that spoilt it. This is one of them, the fact that I felt cheated by a restaurant, The Priest Hole in Ambleside, that said they would do a children’s meal, but then charged the full adult price. The cost of two meatballs with some pasta was £5.99 making it the most expensive meal I have ever bought for a one year old. As such I have sent a letter to the Cumbria Trading Standards complaining about the way we were deceived by The Priest Hole. To put this in perspective the amount we were charged extra is actually no more than we would have left as a tip, having being told we would get a child’s meal but then charged full price I did not leave a tip. The thing that I do object to is that they told us that they would provide a child’s meal, but then charged the full adult price because we did not order the right kind of meal. This could have been avoided and saved all the embarrassment on both sides had they just provided a menu listing the children’s food and how much it cost. By not displaying the children’s options I believe that they were actually breaking the law, specifically the Price Marking (Food and Drink Services) Order 2003. If dining with young children I would suggest you avoid The Priest Hole, on Church Street in Ambleside. There are several other places in the town that do provide proper children’s menus. 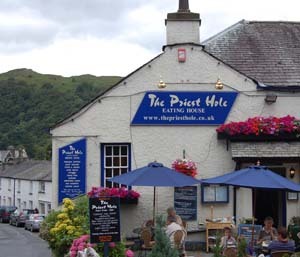 I am writing in complaint about deceptive pricing indications that I was given when dining at The Priest Hole in Ambleside on the 10 July 2007. The address being The Priest Hole, Church Street, Ambleside, LA22 0BU. The restaurant gave me the impression that I was going to be offered some food at a children’s price, but they then charged the full adult price of the meal. I believe this is a violation of Price Marking (Food and Drink Services) Order 2003. I believe that the restaurant should be instructed to either provide precise details of what children meals they do offer, or to be instructed to stop giving misleading statements. I went into the restaurant with my wife and one year old daughter. There was no indication whether they had facilities for children so I specifically asked if they “had a high chair and a children’s menu”. I was told that although they didn’t specifically have a children’s menu they could provide a “pasta based meal in a children’s portion”. I believe there was a clear implication that in asking for a Children’s menu and a child sized portion that this would then be charged appropriately. We ordered meatballs and pasta asking specifically for a “child sized portion”. This seamed to satisfy the pasta based meal that they had indicated to be available as a child’s meal, and they made no indication at the time that it would not be. When the meal arrived it did indeed appear to be a small portion, consisting of two meatballs in a small dish of pasta. After we had finished our meal and were presented with the bill I noticed that we had been charged the full adult price of £5.99 for our daughters meal. I immediately queried this, to be given the response that we had ordered the wrong kind of pasta meal, and that it was not available at the reduced price. I found this most frustrating as if they had told us before we would have ordered something different, or perhaps gone elsewhere for a more reasonably priced meal. So although being told that we could have a child priced meal, by not providing up front any indication of what meals were or were not included we were mislead into purchasing a meal that was not available as a child priced meal. Please can you investigate this and give appropriate direction to the restaurant in question so that others are not mislead into ordering an adult priced meal when ordering food for children. I believe this would be best achieved by them providing a child’s menu, or indicating on the normal menu which meals are available as a child option. This entry was posted on Friday, August 10th, 2007 and is filed under Babies, Children, Tourism. You can follow any responses to this entry through the RSS 2.0 feed. Both comments and pings are currently closed.